Because it isn't enough that we have my blog, Toast Floats the web site, Toast Works the other web site, and a berzillion other things for me to track, DrC and the girls insisted they have their own boat site. I'm going to go all technical writer on you and define this. 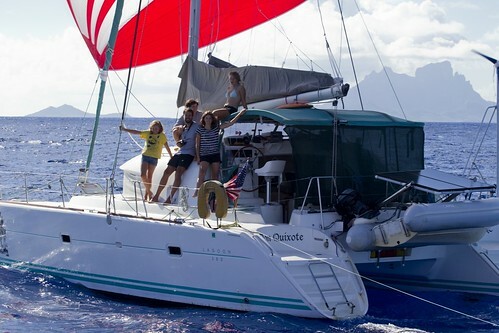 A boat site is a small, family web site devoted to the cruising adventures of a single boat and crew. There are many outstanding boat sites and many truly horrid ones. What distinguishes a good one is a combination of appealing and readable layout, interesting content, and up to date posts which go beyond, "We stopped in Punta Big Fish and got a pastry. Then we went swimming." From the crew's perspective, it also must be very easy to update the content or forget it. There are too many more interesting things to do out there then spend a lot of effort prepping, copying and posting. 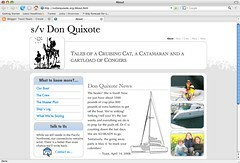 Does the s/v Don Quixote site meet these criteria? Hard to say. At this point, it's just a destination with content virtually identical to what is already available on toastfloats.com for those who've checked that out. The girls and DrC, however, swear up and down that they plan to blog regularly, take lots of pictures, and fill their links with all kinds of interesting stuff. Here's to the Conger Clan providing hours of excellent browsing pleasure.